The Saints of Kulture's B.I.G. Program is a program that collects donations of old back issues of car, motorcycle & tattoo and other kustom kulture related magazines and resells them to raise scholarship money for our partnership with the Montgomery County High School Automotive Trade Foundation and other trade school scholarship programs. We will sell each magazine for $2 to $5 and $1 from each sold magazine will go directly towards the scholarship fund that will allow a student or students take further automotive/motorcycle repair training in order to secure jobs in the industry.The remaining amount from the sale will be used to help offset some of the costs of Bingo's Swap Meet Garage such as packaging, advertisement and expenses. A large majority of the magazines will be reader quality back issues, but any donated magazines that have a higher market value than the $5 will be sold accordingly and $2-$3 of each sold will go directly to the scholarship program. 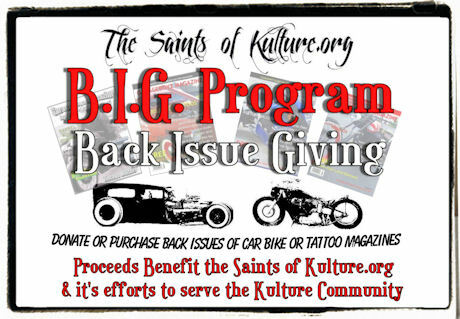 We are actively seeking magazine donations related to cars, bike, tattoos and the Kulture. We ask that all magazines be complete with no missing or cut out pages. Magazines with no subscription address labels glued to the cover are preferred. We will bag and board the issues that are to be sold. Any damaged magazines, magazines deemed unsaleable or that are not sold after a certain time period will be recycled. While we appreciate any magazine donation offers, due to space issues or current inventory on occasion we will may be forced to decline accepting some magazine collections. The Saints of Kulture is a social organization and is not currently recognized as aNOT a 501c3 non-profit and therefore we do not offer any tax-reciepts or benefits to donors. We are creating a .org website in the future showing how the fund raising efforts are going. You will also be able track the progress & success of the B.I.G. Program on this page soon as well as upcoming blogs and social network announcements.